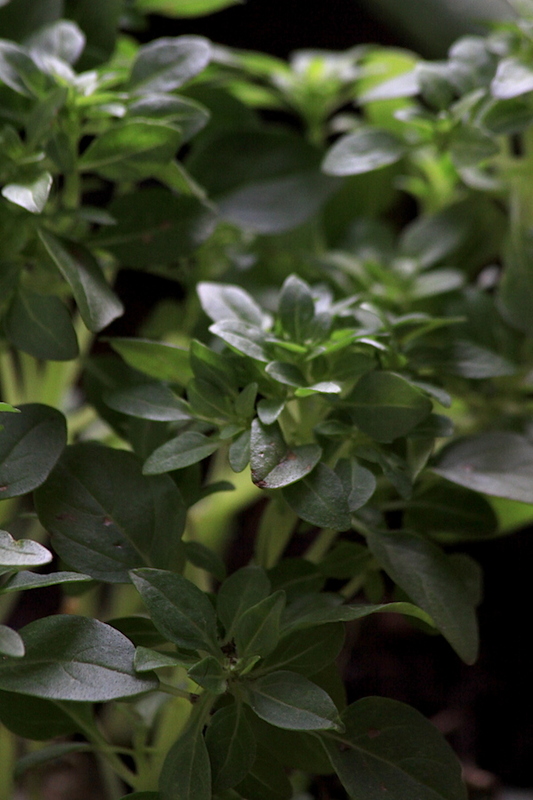 Found the best basil ever in a market: so aromatic! Blend everything with a hand held mixer or food processor until smooth. The tomato sauce I used was made with oven baked garden tomatoes. I cut the large tomatoes into 3 or 4 pieces and the little ones remained uncut. I added some olive oil to a baking tray, placed the tomatoes on it and baked them in the oven on 185°C for 45 min (or longer depending on your oven and on your tomatoes). I allowed them to cool down inside the oven and after a few hours they were very aromatic, creamy and tasting like Italian food. Then I added sea salt, fresh herbs such as savory, rosemary, oregano, lovage (just a little bit), and blended it all together (with a hand held mixer or food processor). 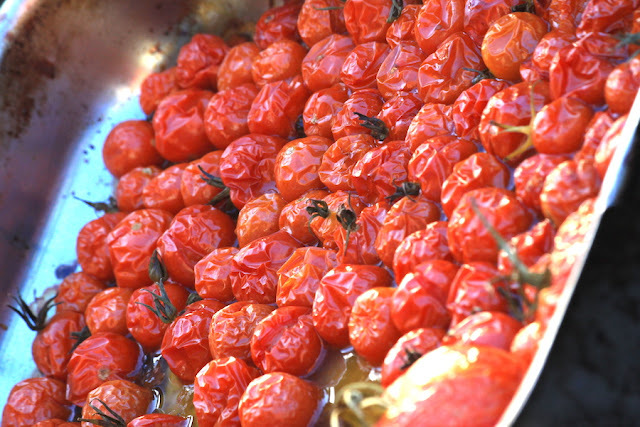 If using cherry tomatoes, like the ones from the picture above, remember to remove the little greens on them before blending. Often I also remove all the tomato skins after baking them - pretty easy. But it is not a big deal if you leave the skins. Cook the lasagne sheets for like 5 minutes if they are already pre cooked and for 9 minutes if they aren't. They should be flexible but not totally cooked otherwise they break. 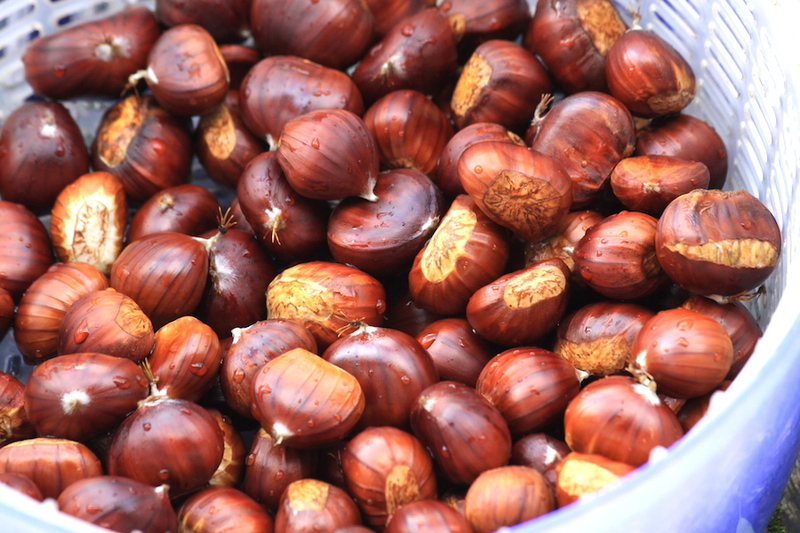 Cook a few each time depending on which cooking pan you are using, as you need to remove them from the water and immediately fill them with the chestnut filling before they cool down completely. Add some olive oil to a baking tray, a little bit of water and if you want add some tomato sauce or a bit of the chestnut cream diluted in more water, so as to allow the lasagne sheets to cook further in the oven without sticking to the bottom. Add a bit of the chestnut cream on the 1/4 end of the lasagne sheet and make sure it is evenly spread, so that when you roll the cannellonis they will stay in shape. Roll one by one placing them right next to each other. Avoid using a too large baking tray that the cannellonis have too much space to roll out and open up. Cover them with tomato sauce. 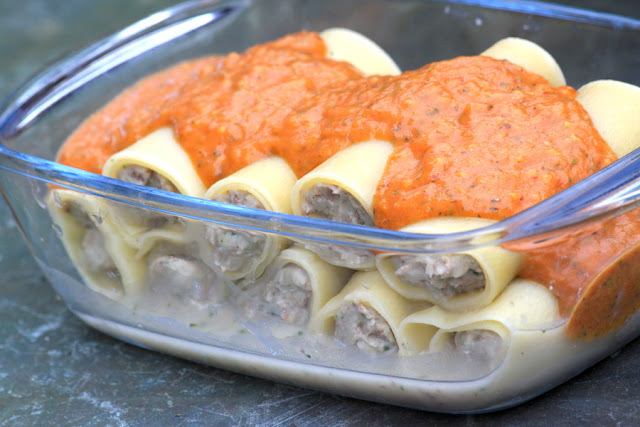 In the picture the tomato sauce is still pretty creamy as I made it but just before placing the tray in the oven, I added water enough to the sauce so as to allow the rolls to get further cooked in the oven. They should be totally covered in sauce not to dry out and get crunchy. 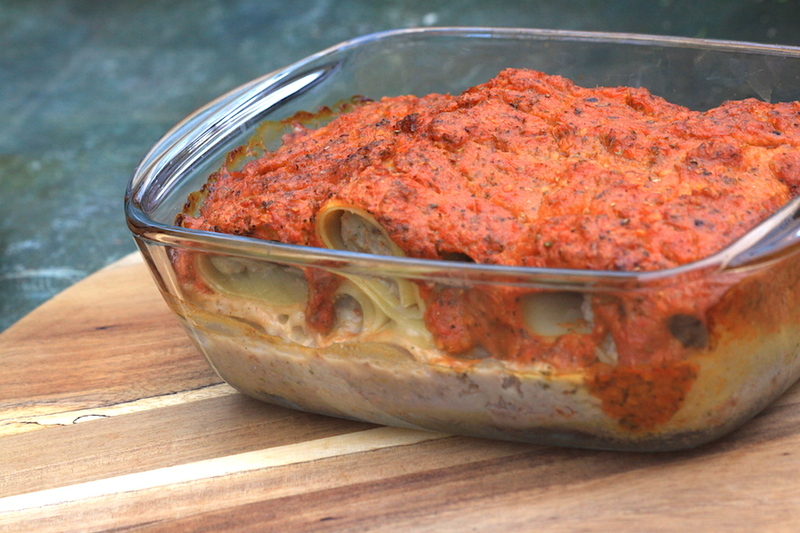 Bake it in the oven at 195°C for 20 minutes or for as long as it takes for the lasagne sheets to get soft. It really depends on the brand you use and on how much pre-cooked they have been. If you notice they are not yet cooked but the sauce starts to dry out, feel free to add more water to the top. When it is not chestnut season you can easily use a mix of cashew nuts, walnuts and white beans or chickpeas in this recipe.